The majority of Warwickshire's population live in the north and centre of the county. 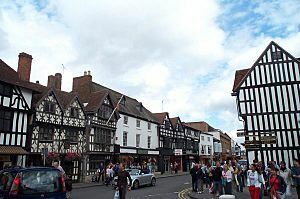 The market towns of northern and eastern Warwickshire were industrialised in the 19th century, and include Atherstone, Bedworth, Nuneaton, and Rugby. 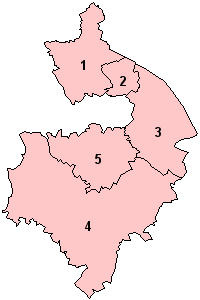 Of these, Atherstone has retained most of its original character. Major industries included coal mining, textiles, engineering and cement production, but heavy industry is in decline, being replaced by distribution centres, light to medium industry and services. 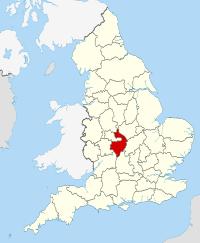 Of the northern and eastern towns, only Nuneaton and Rugby (as the birthplace of rugby football) are well-known outside of Warwickshire. 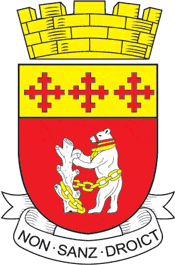 The prosperous towns of central and western Warwickshire including Royal Leamington Spa, Warwick, Stratford-upon-Avon, Kenilworth, Alcester and Wellesbourne harbour light to medium industries, services and tourism as major employment sectors. The M40 motorway, which connects London to Birmingham, runs through the centre of the county, and serves Leamington Spa, Warwick, and Stratford. 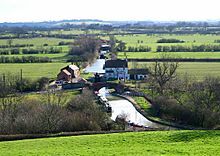 The Chiltern Main Line, the former Great Western route from London to Birmingham passes through the centre of Warwickshire on a route similar to the M40 motorway, and has stations at Leamington Spa, Warwick, (and Warwick Parkway), Hatton and Lapworth. Rail services are provided by Chiltern Railways and London Midland (Birmingham to Leamington only). There are also two branches off the Chiltern line, one from Leamington to Coventry, and another from Hatton near Warwick to Stratford. The West Coast Main Line (WCML) runs through Warwickshire. 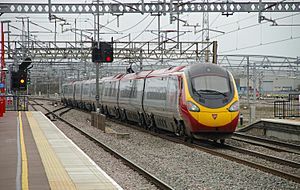 At Rugby the WCML splits into two parts, one runs west through to Coventry and Birmingham, and the other the Trent Valley Line runs north-west towards Stafford and the north-west of England. This section has stations at Nuneaton, Atherstone, and Polesworth (North bound services only). There is one branch off the WCML from Nuneaton to Coventry, and there is a station at Bedworth on this branch. 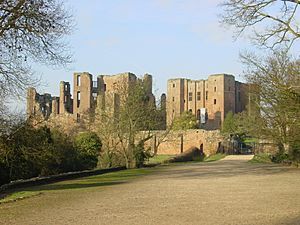 The only major town in Warwickshire not to have a station is Kenilworth. Although the Leamington to Coventry line passes through the town, its station was closed in the 1960s as part of the Beeching Axe. The station is now slated to re-open in December 2016, although currently there are no local services operating on the line, as it is used only by CrossCountry services. In March 2014 the freedom of the county was bestowed on the Royal Regiment of Fusiliers, the honour was officially bestowed following a parade through Warwick on 6 June 2014. Warwickshire is perhaps best known for being the birthplace of William Shakespeare from Stratford-upon-Avon. Even today, road signs at the county boundary describe Warwickshire as "Shakespeare's County". The county has also produced other famous figures such as Aleister Crowley (from Royal Leamington Spa), George Eliot (from Nuneaton), Rupert Brooke (from Rugby), and Michael Drayton (from Hartshill). The poet Philip Larkin lived in Warwick (born in nearby Coventry), and Elizabeth Gaskell went to school in Barford and Stratford. Folk musician Nick Drake, who record for Island records in the late 60s, early 70s, lived and died in Tanworth-in-Arden. Warwickshire Facts for Kids. Kiddle Encyclopedia.